Cashed up from the POSCO sale – what’s next for Galaxy Resources? Galaxy Resources Limited (“Galaxy”) is a global lithium company with lithium production facilities, hard rock mines and brine assets in Australia, Canada and Argentina. It owns the Mt Cattlin spodumene and tantalum project near Ravensthorpe in Western Australia and the James Bay lithium pegmatite project in Quebec, Canada. Galaxy is advancing plans to develop the Sal de Vida lithium and potash brine project in Argentina situated in the lithium triangle (where Chile, Argentina and Bolivia meet), which is currently the source of 60% of global lithium production. Sal de Vida has excellent potential as a low cost brine-based lithium carbonate production facility. Lithium compounds are used in the manufacture of ceramics, glass, and consumer electronics and are an essential cathode material for long life lithium-ion batteries used in hybrid and electric vehicles, as well as mass energy storage systems. 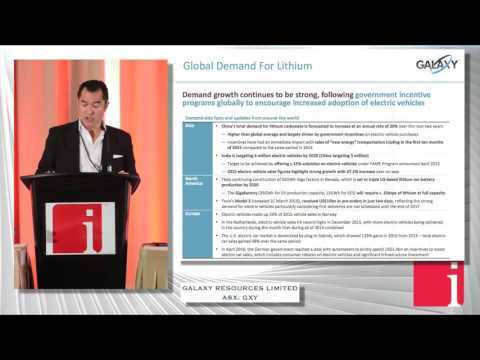 Galaxy is bullish about the global lithium demand outlook and is aiming to become a major producer of lithium products.